June 13th, Vagabond is at the appointment to welcome the team "walrus". Just above the polar circle, at the end of a magnificent fjord long of 170 km, is the main airport of Greenland. Scientists Isabelle Charrier and Thierry Aubin are joining us for one month, in order to record walruses. A project supported by Institute Paul-Emile Victor and by National Geographic. 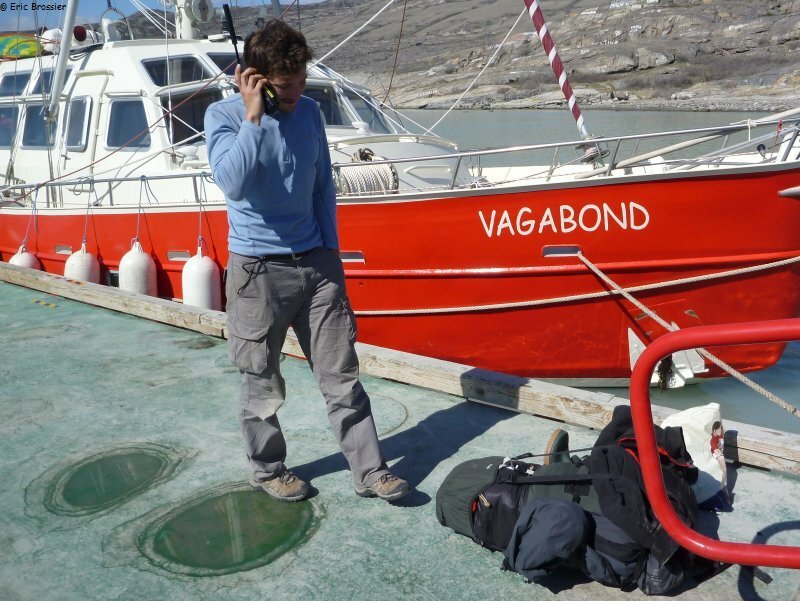 Charlotte Blan and Nicolas Gilbert arrived with them, sent by Océanopolis (Brest), to make a film about the expedition. It is also here that Carlos and Piem are leaving us. Carlos will be back in Tunisia in a few days, to serve fine cuisine to the French Ambassador's guests. While my dear little brother Piem is starting a new life: only with his backpack, carefully prepared, he has ahead of him the easiest but also most difficult trip. For many months or years, without planned route neither agenda, and with a minimum budget. He is first thinking about a one week trek... if mosquitoes are OK. Then, he would be looking for a boat to go to North America. I'm pretty move leaving my best homeless, and I suddenly find Vagabond quite heavy, complicated, safe and comfortable.